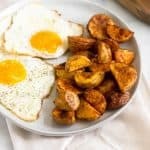 Crispy Roasted Breakfast Potatoes are crispy on the outside, soft in the middle, and baked not fried! 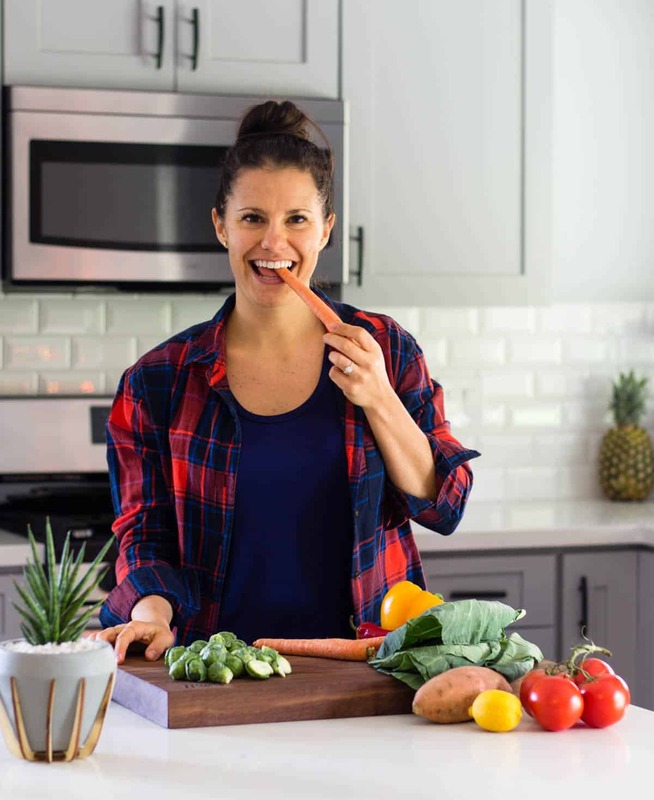 Paleo, vegan, gluten free, and Whole30 approved! They will be your new favorite side! Sometimes the simplest recipes are the best kind of recipes. 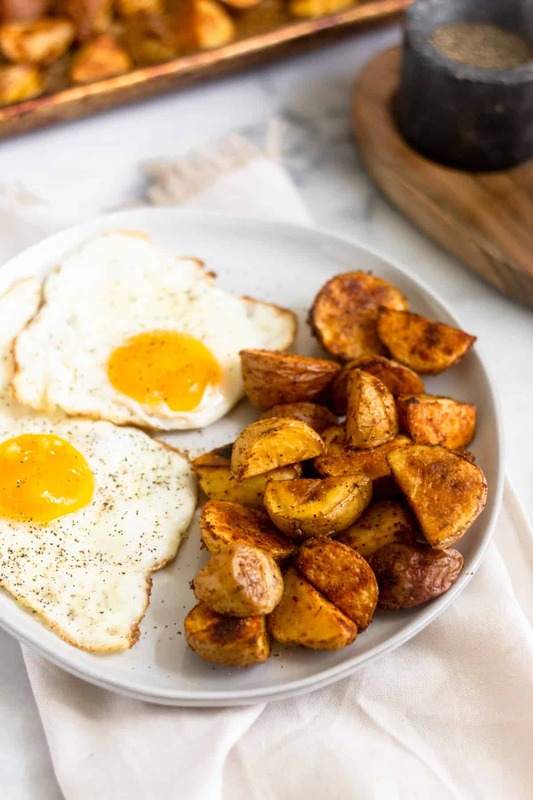 We’ve been making these crispy roasted breakfast potatoes for at least a year and a half – they are a staple in our house for meal prep. I share them on my Instagram stories all the time and people always ask how I get them so crispy, what seasonings I use, what temperature to bake them on… I’ve typed out the instructions more times that I care to remember. 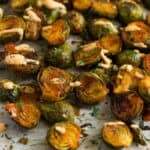 Even though they are so simple, I figured it was finally time to get the recipe on the blog. That way it can have a home and then I can direct people here instead of typing the recipe out each time. It’s kind of funny though, cause I’m sure each time I tell someone the recipe, it’s slightly different. I would say this is the only time I actually measured the spices and that was just so I could get it on the blog. Most times I just add oil, a bunch of shakes of seasonings, mix it all up, and throw it in the oven. You’ll find me cooking like that most days. But for the sake of the blog, this is how you do it! 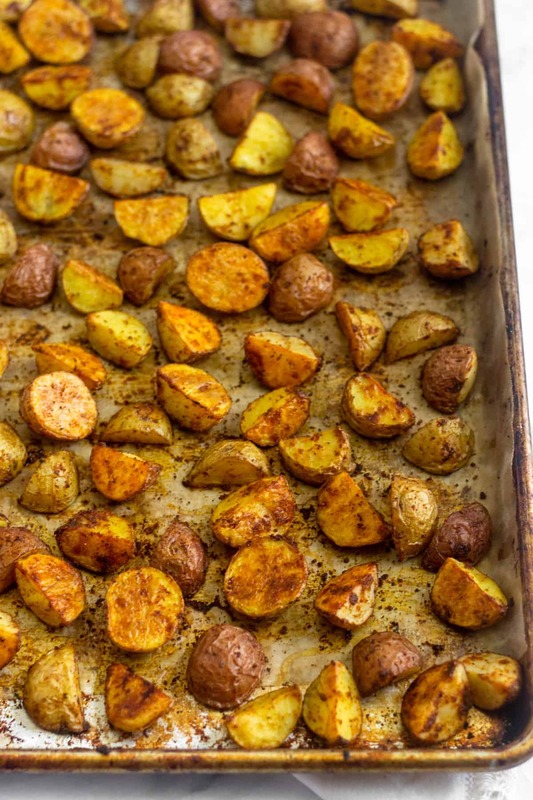 These potatoes only call for a handful of pantry staples, 1-2 baking sheets, and some parchment paper. 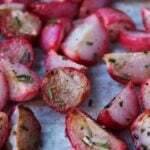 I find the parchment paper works the best for roasting. It’s really as simple and cutting up the potatoes in somewhat uniform pieces. There will always be some smaller and some slightly larger than the others, so don’t sweat it. Place on the parchment lined baking sheet and top with oil and spices. 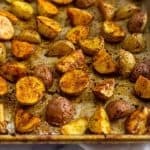 I like to mix it all up on the baking sheet because it saves dishes and the seasoning is on the pan rather than a bowl. Spread them out so they aren’t super close and bake until crispy! It doesn’t get any easier! 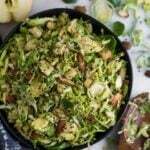 Since this makes a big batch, there will more than likely be leftovers. We like to eat them cold right out of the fridge, as we do most of our leftovers, but I get that isn’t a lot of people’s thing. If you are home, I would suggest heating them up over the stove in a skillet with a little oil. They will warm up and still be crispy. If needed, you can also heat them in the microwave, but they won’t be as crispy. Just giving ya a fair warning. 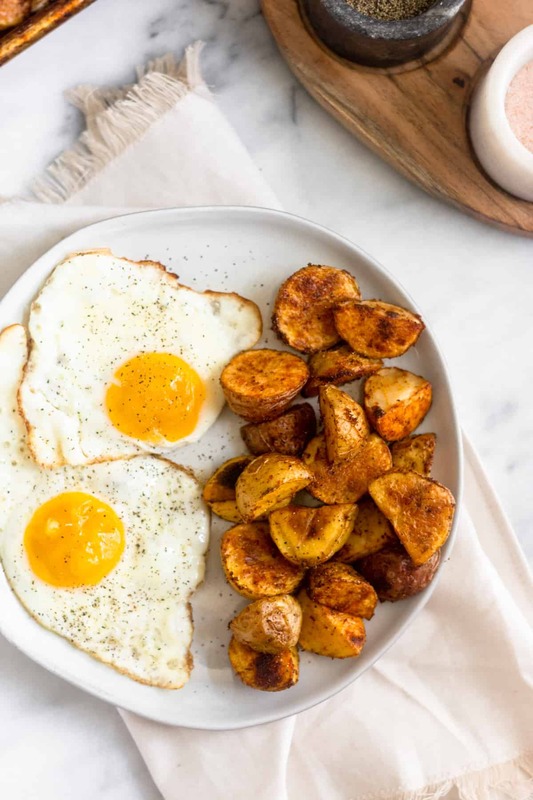 The best thing about these crispy roasted breakfast potatoes, is they are not really just breakfast potatoes. 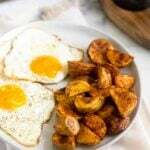 I debated about calling them crispy roasted potatoes, but we do usually make them for breakfast. They can totally be made for any meal though! We will make them for breakfast and enjoy the leftovers with random meals throughout the week. 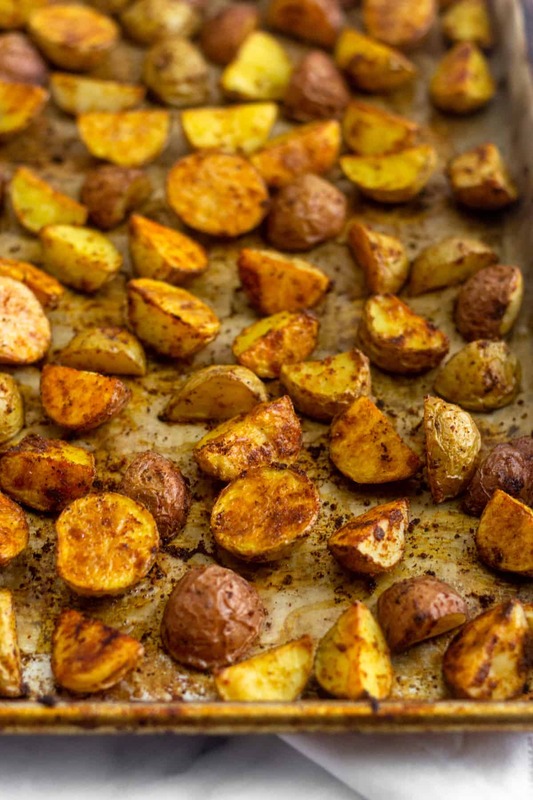 Roasted potatoes make a great meal prep that can be added to just about any meal! Preheat oven to 400 degrees Fahrenheit and like a baking sheet with parchment paper. 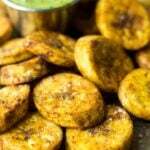 Cut potatoes into 1-2 inch thick pieces. For the baby potatoes, I just quartered them, but it depends on what kind of potatoes you use. 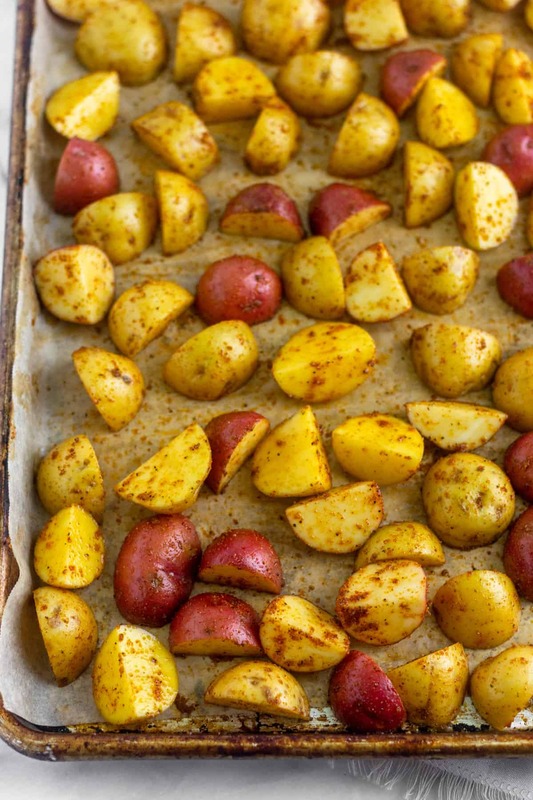 Place potatoes in a pile on baking sheet. Cover with oil and seasonings and toss to combine. I used my hands to make sure all potatoes were covered. Spread out so they have some room between each other. If needed, use another baking sheet. Roast for 50 minutes, flipping/rotating potatoes about 30 minutes in, until golden brown and crispy. Store in a sealed container in the fridge for up to a week. Super easy and delicious! Made enough for four meals, which is great for my Whole30 meal prep! So glad you liked them! They are a staple at our house. Thanks for trying! 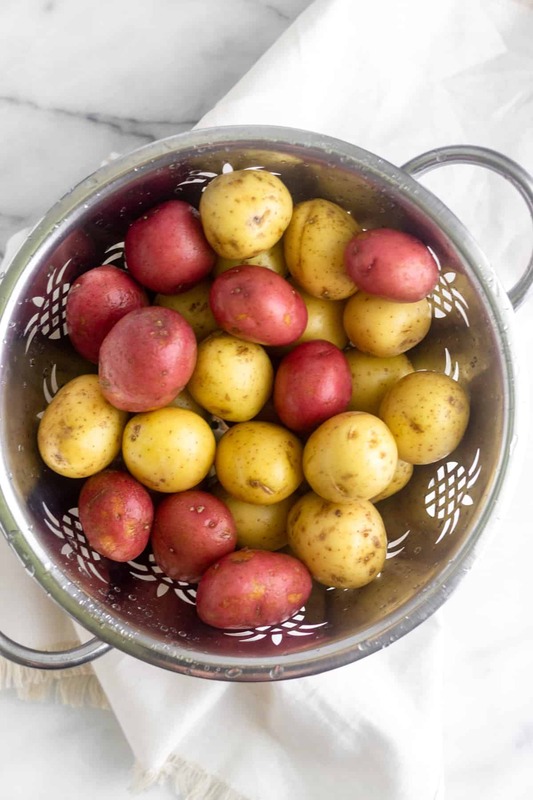 This is my go-to potato recipe. I don’t know what it is, but they are perfectly crispy every time!! 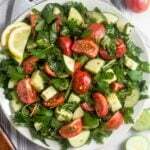 It’s quick, easy, and absolutely delicious! Yay, so glad to hear that Stefanie! They are our to-go as well 🙂 thanks for trying them!